Located in a strategic position at the northern end of the Mozambique Channel, the archipelago of the Comoros Islands consist of four islands: Ngazidja (Grande Comore), Mwali (Moheli), Nzwani (Anjouan), and Mahore (Mayotte). The Comoros capital city Moroni is on Grande Comore. The Comoros Islands arose from the seabed of the Western Indian Ocean as the result of volcanic activity and they once played a major role in the world economy of the ocean. For centuries, they were a major stopover along the mercantile routes of the Indian Ocean from Africa to the Orient. In the waters around the islands, lives the famous Coelacanth. It is a unique fish once thought by western scientists to have been extinct for millions of years. But in the second half of the last century, an ichthyologist learned that Comorian fishermen regularly caught coelacanths in the deep waters surrounding the islands of Ngazidja (Grande Comore) and Nzwani (Anjouan). Several specimens have since been preserved and can be seen today in museums around the world. There is an abundance of life in the sea around the Comoros. One can find everything from giant whales, large sharks, big manta rays, sailfish, sunfish, to lobsters, crabs and tiny shrimp. Deep water close to the islands, coral reefs, miles of sandy beaches, plus fresh water streams and shoreline springs provide multiple habitats for the marine life. The islands became a French colony following the Berlin conference of 1886-7 and remained under French political control until 1975 when three of the islands: Ngazidja (Grande Comore), Mwali (Moheli), and Nzwani (Anjouan), declared themselves independent from France. They are now forming the Union Of Comoros with each of the three islands given considerable autonomy. 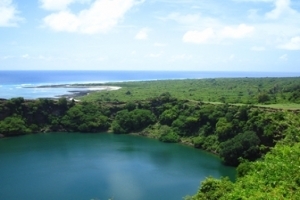 The fourth major island of the archipelago, Maore (Mayotte), continued to be administered by France although Maore belongs within the sphere of the independent nation of the Comoros which has been recognized by the United Nations' General Assembly.